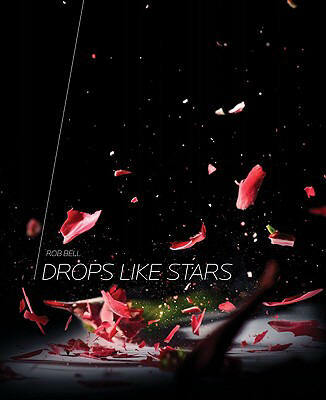 I want to briefly tell you about a stunningly original book, an example of an unusual and rare commitment on the part of an evangelical publisher, the new coffee-table sized gift book by Rob Bell, Drops Likes Stars (Zondervan; $34.95; see blog special price, below.) I have to tell you that I’m not going to tell you what that title means, but you will know by the end of the 150 + page book. The subtitle is important: A Few Thoughts on Creativity and Suffering. I can hardly explain more without spoiling the experience, but this art book is a designed presentation of what seems like a Rob Bell sermon. It is actually the companion book to a small tour he did, taking this show on the road, exploring this endlessly complex relationship between art and generativity. It includes some Bible, some stories, some rock song lyrics, a poetry shard, an analogy or two, a quote from a contemporary artist and a funny movie quote. A story about Johnny Cash. One about Pope John Paul. A tender story about a child full of wonder. All presented with very 21st century artistic visual aesthetic. Is it therefore postmodern? Pu-leese. It is just a very cool gift book, a coffee table resource, a book with pictures. An allusive book with hipster design. A wonderful story, asking about how our suffering can be redeemed, if we can be bored of life, if we can find new passion to live meaningfully, even artfully, amidst the dross and strang fo these times. If we can see drops like stars. Is there a relationship between creativity and suffering? Is our sad human condition somehow met by the God of the Bible? Can we embrace prophetic imagination and wonder and joy, even as we lament and experience ache and brokenness? We want to share this brand new book now, as it will be a blessing to many. My hunch is because it is a bit unusual–the provocative design and higher price-point—-it will not be on the best-seller list of most Christian bookstores. We want to sell it considerably reduced price, hoping you will enjoy it, ponder it, perhaps give it. Here is an article that was in the Christian Century that explains Bell’s appeal Here is an interesting interview from Christianity Today. His entry at Wikipedia is a good introduction, with a long list of links, including some that are critical. Check ’em out. AND: while ordering this, get any other Rob Bell book or DVD at 30% off. What would it cost for it to be shipped to Vancouver? Thanks for asking…hope you check back in to see this reply. It is 2:40 am and I can’t quite figure that out now. Here’s what to do: PLEASE send an email to us at read@heartsandmindsbooks.com and our mail out staff person will see it Monday and she can calculate the options and reply to you easily. There are options–UPS or mail, faster or slower choices for each. It would help if we had your postal code, but we’ll make up a general Vancouver one to estimate. If you reply here, our mail out staffer won’t see it, and I will be away next week. SO ya better email us or use the inquiry page at the website, which she will also see and reply per usual. THANKS. Thanks. I will send an email.